In early July 1864 Washington was in something of a panic. Jubal Early fresh from his victories in the Shenandoah Valley was driving north towards Washington. The extensive fortifications of Washington had been stripped of men, sent south to participate in Grant’s Overland Campaign. Grant on July 6, ordered two veteran brigades of the VI Corps to be shipped to Baltimore by sea. Until they arrived, all that stood between early was Major General Lew Wallace and 6300 Union troops, many of them recently recruited 100 day men, short term enlistees mustered into service in the Spring of 1864. Few of Wallace’s men had ever seen combat. The future author of the block buster novel Ben Hur, the West Point trained Wallace had not had a good war up to this point. Unfairly made a scape goat after Shiloh, Wallace had been shunted aside to non-combat assignments, his most notable achievement being his preparation of Cincinnati for a Confederate attack that never came during Bragg’s invasion of Kentucky in 1862. Now the commander of the Mid-Atlantic region, the War had come to him. Wallace decided to stand and fight at Monocacy Junction three miles south of Frederick, Maryland. At Monocacy the Georgetown Pike to Washington and the National Road to Baltimore both crossed the Monocacy River there as did the Baltimore and Ohio Railroad. Delaying Early here would give at least one more day for reinforcements to get to Washington. 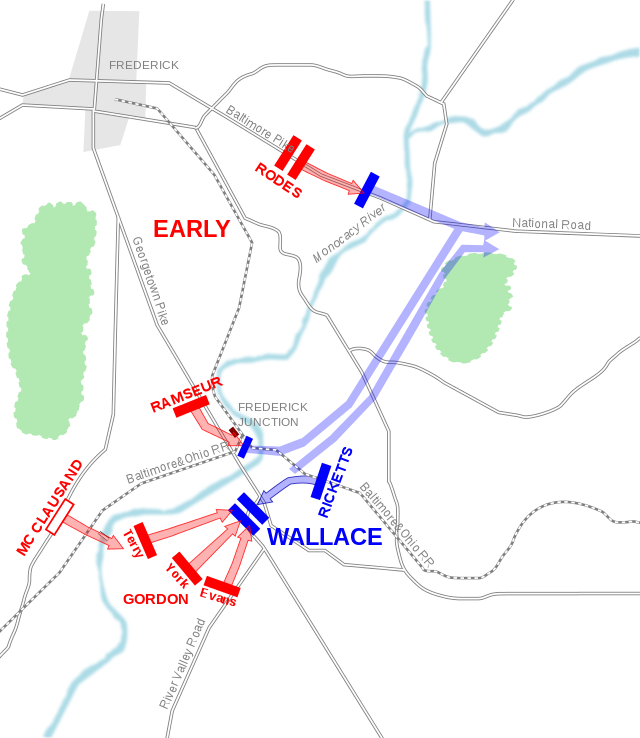 Wallace was in luck and VI Corps troops from Baltimore reached him before the battle. The odds were still long however, 5800 Union troops facing 14000 Confederates, with Wallace’s men defending a six mile front to guard the Georgetown Pike, the National Road and the Baltimore and Ohio. Union casualties were 1294 to some 700-900 Confederate.